This lesson plan is accompanies readings from the book Deli Sarkis: The Scars He Carried by Ellen Sarkisian Chesnut. The lesson was created by Frank Perez, World History teacher at San Benito High School in Hollister, CA. Deli Sarkis: The Scars He Carried tells the story of an Armenian who witnessed first-hand the atrocities of the Armenian Genocide of 1915-1923. 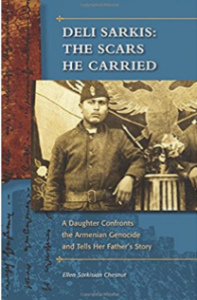 The book is a tale of two journeys: the author’s journey to discover the facts, places, and people in order to write her father’s story, and her father’s journey from near death to survival.